Management, Strategy, Organizational Behavior/Development Human Resources, Business Ethics, Operations, Project Management, Accounting, Finance, Hospitality and Tourism, Entrepreneurship, Marketing, Others. Embryo cases: A one-page outline of a case idea including a list of developmental issues for which the author seeks guidance (limit of one embryo submission per author – MUST Use the Embryo Form on our website). Compact Cases (3-5 pages in length): Provide a focused exploration of a real event, issue, or incident in a real A full Instructor’s Manual must be included. Blind, peer review process. At the conference, experienced case writers provide specific, developmental feedback, in a roundtable format. Format instructions for submissions are provided on the CASE website. Cases MUST be submitted through the EAM website (http://eaom.org) starting October 1, 2018. Professional Development/Case Hackathon: Facilitated 8-hour case training program related to writing, and research. 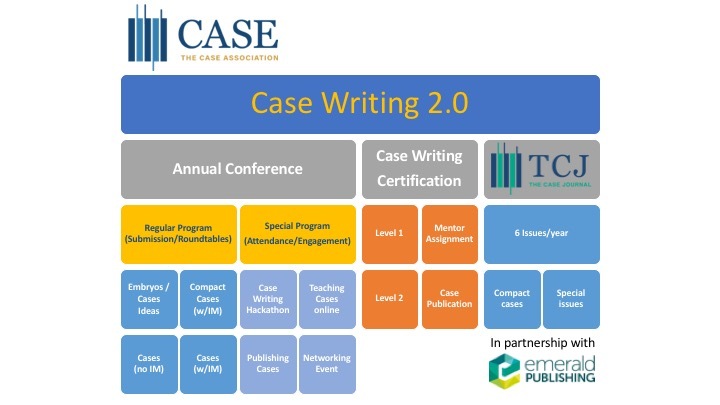 Case Writing 2.0 is The CASE Association’s new comprehensive programming effort designed to foster high quality case research, writing, instruction and publication for academics and practitioners alike. It consists of our annual conference co-hosted with EAM, our new case writing certification program (supported by a mentoring program), and our partnership with Emerald Publishing with the publication of The CASE Journal 6 yearly issues full of cases and case notes. is designed to promote case writing through a roundtable format and interaction where case ideas emerge (embryos), cases are developed (cases without instructor manual), and cases are critiqued (cases with instructor manual) to improve their chances for publication. The conference program is centered around developing the case writer and instructor with many networking and co-authoring opportunities. This year’s case hackathon facilitated by Dr. Rebecca Morris (Editor of The CASE Journal) will allow participants the opportunity to develop cases live with other attendees. Finally, our special focus on teaching cases online will allow attendees to develop the tool kit that is sure to improve their teaching effectiveness. We support Ph.D. students and scholars in training, practitioners (SP, PA, and IP) wanting to make a transition to full time instruction, but more importantly scholars who want to have an impact in line with AACSB International requirements. Launched in 2017, the two -stage, online, self-paced certification program aims to support, sustain, and encourage case writing through professional development. Level 1 is a structured program of videos, user guides and exercises, individual mentoring by experienced CASE members, and a final evaluation. Level 2 consists of our Certified Case Writing Professional, which requires success in Level 1 plus evidence of publication of two cases in peer -reviewed journals. Our certification program is open to members or non-members and is totally conducted online. The CASE Journal, published by Emerald Publishing, is a great outlet for cases, compact cases, new forms, and articles and conceptual papers on case teaching, case writing, case reviewing, and similar topics.